A few months ago, after following my doctor's advice and completing a series of sessions with a physical trainer to improve my balance, I bought a kick scooter. A Xootr Mg Kick Scooter. Yes, a kick scooter. Same as your five year old grandkid uses to tootle around the living room. The idea was to continue working on my balance, and have a portable device to expand my radius of mobility when I use the public transportation network. Truth to tell, it's helped me a lot, and proven as well to be a delightfully fun vehicle to explore the bike paths in our parks, around our lakes, along our waterways. I recommend kick scooting to everyone! It's way easier than you think. 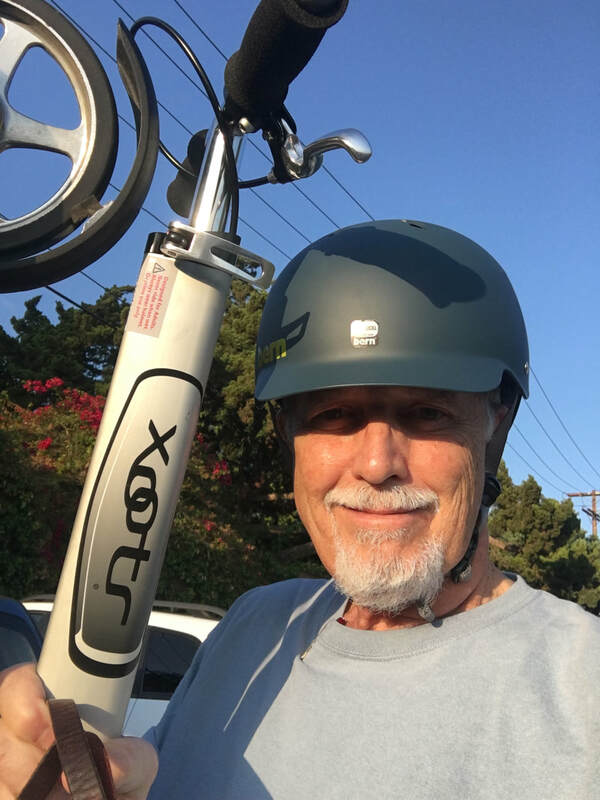 February 12, 2018, I rode from City of Hope in Duarte to the Norwalk Green Line on the kick scooter in about 3 hours, including a short food break, plus stopping to take a phone call. 21 miles. Nice pace. It was a long ride, but I planned it to see if this old guy could do it. Turned out to be about 2,500 scoots, instead of the 2,000 estimate. It’s easy to count, 20 scoots on the right foot, 20 on the left. Do that 10 times. That’s what I call a set. 400 scoots, about 4 miles. Gives me something to think about on the trail, besides observing the birds and the water and the colonies of homeless people. Weather was cool, with more than the usual head winds….it was warm enough while I was riding, but I wished I’d worn a long sleeved shirt while riding the Green —> Blue —> Gold line rail back to Sierra Madre. Anyway, it felt good. I look forward to doing the next leg, Norwalk to the sea, some time soon. "Love this video on so many levels. The just fun and ambition of the undertaking, the NPR-ready narration, shot composition and the editing. How do you ride and get such steady-cam video? Goin’ viral." "You go and keep going. What’s life all about anyway?" Jonathan Kelley is a 77 year old retired anesthesiologist and has been enjoying his time out of the work force for over a decade. Among his pastimes are acting, interacting with the homeless, perfecting his croissant recipe, and avidly riding a scooter. Kelley is not like most senior citizens. When he was approaching retirement, he began to consider ways in which he could stave off the ravages of time. He began riding a unicycle, to keep his balance as sharp as possible, but he almost severely hurt himself after falling and recalls reading about the famous actor/dancer Fred Astair retiring with a skateboard in hand, who fell and broke his wrist. 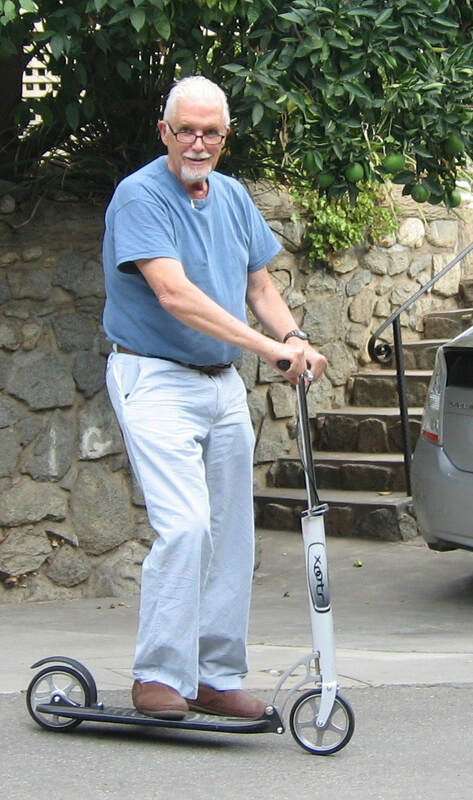 Kelley began searching for alternatives and eventually found himself at The Vault Pro Scooters in Culver City, testing scooters. The light weight, compact carrying, wide standing platform and brake system were all attractive qualities of the model he selected, and soon Kelley was gliding around the streets and paved paths of Los Angeles County. Almost immediately, he began to realize the benefits of this peculiar device that has largely been written off as a toy for children. For example, Kelley is aware of two important things regarding his scooter enthusiasm. The first being that rough pavement and high speeds are the only two real hazards he faces while riding. The other is that he has not seen many adults riding scooters, let alone another senior citizen. While Kelley’s pastime is remarkable in its own right, he has bigger plans for his hobby. “I would like to fuel a revolution for transportation,” says Kelley. 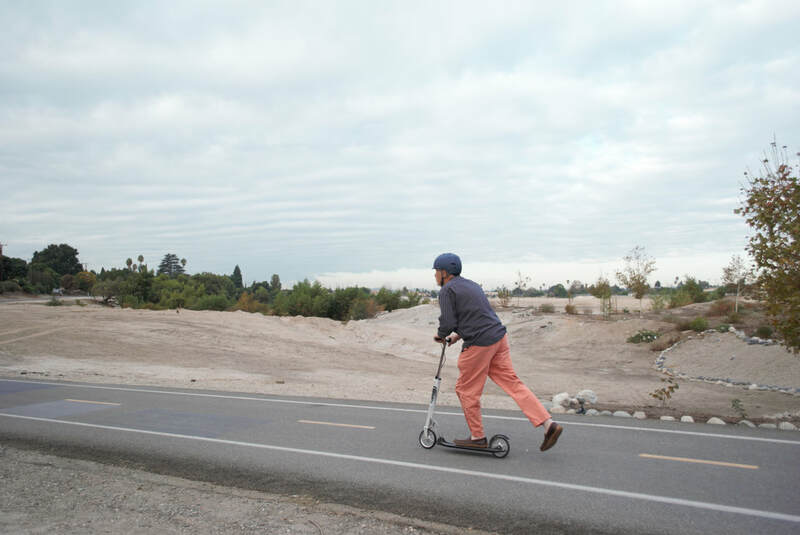 Between the pre-existing methods of public transportation and his portable scooter, almost all of Los Angeles is open for easy transportation and Kelley is going to great personal lengths to spread the word of scooters. Kelley is listed as a demo-rider for Xootr, a scooter manufacturer, at L.A. CoMotion Expo, an event which gathers transportation entrepreneurs and venture capitalists under one roof. The benefits of Kelley’s scooting campaign are many. 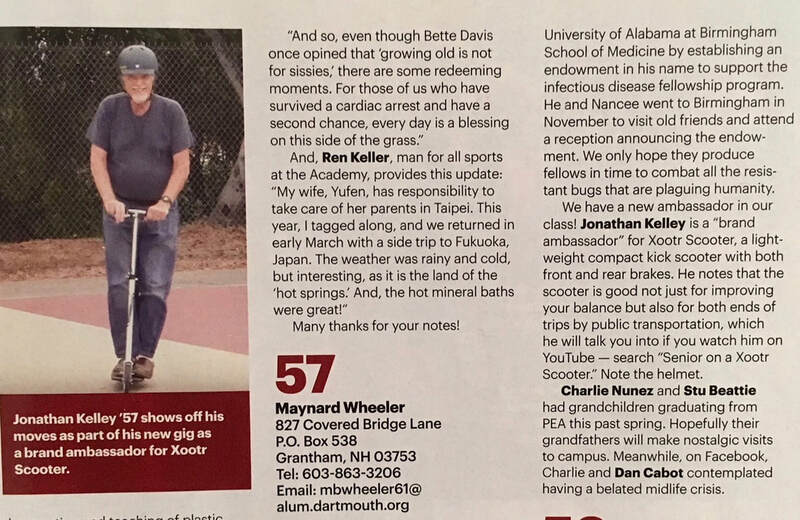 As if personal activity and changing transportation were not enough, he recommends the scooter as an ideal way to get exercise for his fellow seniors. “There are many senior citizens out there who aren’t morbidly obese and don’t get enough exercise,” he said. It didn’t take Kelley long to realize the health benefits of long distance scooting. He started by conducting ten scoots with one leg and switching to the other. A few months later, Kelley is up to twenty scoots per leg. Of course, time has taken its toll on the former Navy doctor. “I’ve got the usual health issues that everyone has to deal with,” says Kelley, citing cancer, type-two diabetes and cataract surgeries, but none of it has been enough to stop him from making a positive impact on humanity and maintaining his mobility. Kelley is currently training to scoot his way down a trail beginning in Duarte and ending in Norwalk, a distance of roughly 19 miles. To learn more about Jonathan Kelly and his scooting crusade, visit his website at https://www.facebook.com/jonathan.kelley.106.